The memo was among more than 700 files leaked Thursday by hacker group LulzSec, which said it obtained them by breaking into the email accounts of several Arizona Department of Public Safety officers. Many of the files, like this one, were bulletins from other agencies, marked as “law enforcement sensitive” and meant to be kept secret from the public. Still, many of the files revealed incidents or plots that were never made public previously. Another memo leaked by the hacker group, for instance, revealed that Border Patrol agents found a roadside bomb along a smuggling route in 2009. The bomb exploded while it was being investigated, but it’s unclear whether anyone was injured. “It is not surprising that another contingent of Minutemen types has come to life,” the analyst said. 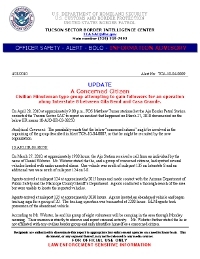 In addition to the freeway shutdown, which never was carried out, the memo also mentioned a phone call that a Border Patrol agent received March 27, 2010 from a man calling himself “Daniel Webster.” The man said the he and a group of “concerned citizens” had spotted several vehicles loaded with illegal immigrants on or near Interstate 8. Agents searched the area but were unable to find the vehicles. The memo speculated that the phone call may have been somehow connected to the group planning to shut down the freeway. They are concerned about “Human Rights Violations” yet still continue this assenine war on drugs. Law enforcement is pathetic. GREAT to see Heat City back doing stories again, and the usual excelent effort, too. Missed you, Nick! If it would benefit the locals, then the government should know what to do. They should always put the rights and convenience of the people on top of their list.